This plum sauce is great atop Chocolate Ice Cream, on our favorite breakfast porridge, Genius Breakfast Cereal, or stirred into a bowl of kefir. It is not too sweet and it is really tasty! 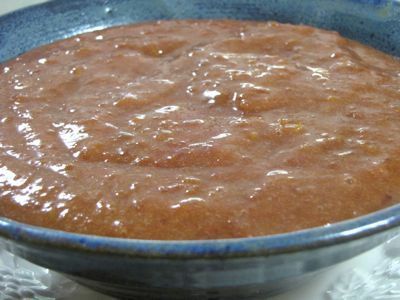 This plum sauce is great atop ice cream, breakfast porridge, or kefir! Makes about 3 1/2 cups. Place fresh or frozen plums, raisins, and honey in food processor. If using frozen plums, this will be cold and ready to go immediately. If fresh, chill until cold. This post was featured in 26 Egg-Free Ice Cream Recipes + 17 Toppings! 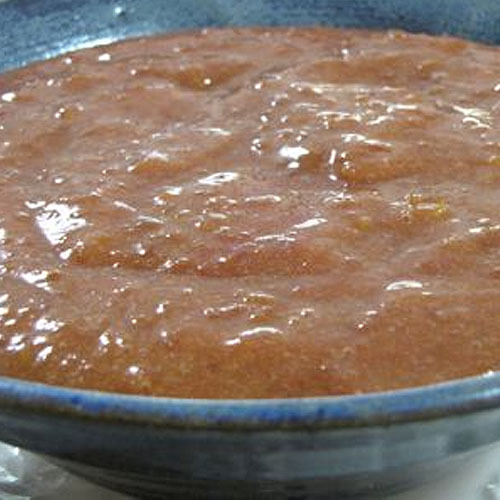 Mmmm… plum sauce is great and very versatile! As yours is not too sweet, you could also try a bit of it on savoury dishes — if you like the sweet-savoury mix. For instance, it can be a good accompaniment to roast or baked poultry meat. Maya, you’re a genius! I wonder how it would be with our roasted chicken breasts tonight? Thanks for the idea! You’re welcome! If you try it, let me know how it went, especially with the kiddies! Maya, well I was a chicken… and didn’t try it. I would have if it was just me. There are a couple family members who don’t like fruity main dishes, so that is why I didn’t, at least yesterday. When you use your frozen plums do you take the skin off or just process everything until smooth? We have a million plums this year from our tree and are trying to freeze and use up the plums.